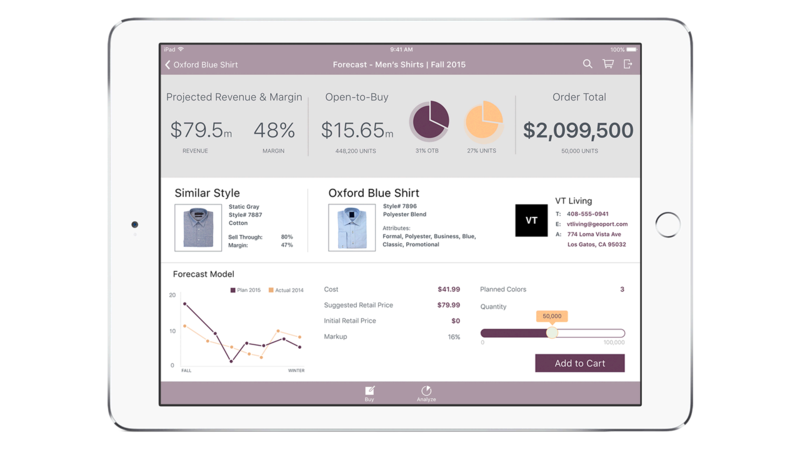 IBM MobileFirst for iOS Order Commit provides real-time views on product data and vendor performance. IBM MobileFirst for iOS Order Commit provides real-time views on product data and vendor performance. The app integrates with systems of record to ensure order commitments are assembled more accurately. It ensures orders align to merchandise strategy and streamlines the buying process on demand - whether on a buying trip, touring factories, or visiting stores. Predictive analytics help support modeling of buy quantities, product selection and vendor negotiations, giving merchants the tools needed for more confident decision-making. Capture photos, videos and notes through a built-in camera on iPad on the go . Make order commitments while viewing assortment plan, prior buys, revenue coverage and available open-to-buy. Access easy-to-understand analysis scenarios that enable you to comprehend the impact of buying decisions on financial targets and constraints. Gain visibility into the most relevant product forecasts, actuals and vendor performance through integration with enterprise systems of record.